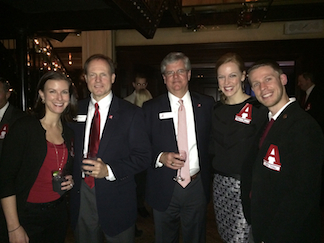 Chapter members mingled with University dignitaries to celebrate the holidays. NEW YORK -- The Greater New York Chapter took some time to enjoy the festive backdrop of midtown Manhattan with its 2013 Holiday Party among a crowd of nearly 40 Alabama alumni and dignitaries from the University. Located adjacent to the Carlton Hotel, Millesime provided an intimate setting for family and friends to celebrate the holidays with some Big Apple hospitality as chapter members were treated to updates from the Capstone from Calvin Brown (Director of Alumni Affairs), Charlie Schaeffer (National Alumni Association President) and Dr. J. Michael Hardin (Dean, Culverhouse College of Commerce). An annual highlight of the Holiday Party, UANYC President Christopher Hollinger raffled off various prizes donated by the National Alumni Association and Dennis Bogart of the Paige Hospitality Group to raise money for the seven endowed scholarships the chapter supports. "We are very thankful to the NAA and the University as a whole for their continued support of the Greater New York Chapter," said Hollinger. "We take a lot of pride in being one of the chapters that the Alumni Association can point to as a positive example among its network of alumni chapters. Our chapter members remain committed to maintain and grow our support for the University in as many ways we can."